Sometimes people in North Vancouver feel just a little bit safer about their personal or assets’ safety by adding an extra layer of security. At Optimum Security, we understand that there are circumstances where you feel like you need security for your home, commercial property or otherwise, and our goal is to provide ceaseless security solutions to put your mind at ease. How do we do it? 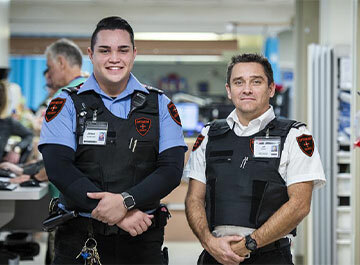 For our North Vancouver customers, we assign highly trained security guards to the assets you hire us to protect, carry out 24/7 mobile patrol and surveillance monitoring, and cooperate with local law enforcement to ensure that we stop security threats before they have a chance to occur. 24/7 Surveillance: We station visible patrols on and around the property you hire us to protect to deter incidents before they arise. In addition, our guards monitor video feeds around the clock and utilize our mobile patrol capabilities to spot a building threat and communicate with you before it becomes an issue. High Visibility: Our guards and patrol personnel believe that if people see our presence, they won’t even think about threatening the security of the asset you hire us to protect. We’ve guarded valuable property, high value businesses and even high-profile persons since Optimum Security started operating as the most dependable provider of security solutions in North Vancouver. We also offer residential and commercial alarm systems that can monitor for break-ins, home invaders or natural security threats and put you in contact with our threat response teams and local law enforcement almost instantly. Contact Optimum Security today. If you live in the North Vancouver area and you have security concerns, you can’t afford not to call the experts.